This high capacity family cottage (10-15 pers, 5 convertible rooms with toilet and shower or bath), is located in the countryside. It offers 10x5 pool and a living area of ​​210m². It will surprise you with its calm and authenticity: you will be welcomed in a stone house and exposed beams 1870 refurbishment. Are available to all guests: a fully equipped kitchen, lounge fireplace for winter nights, a fun upstairs room with board games, TV with international channels and DVD, wifi, baby football. Outside are a terrace with barbecue, a petanque area and ping-pong table and a picnic area overlooking the pool. Many activities are possible around the house: bicycle rides, nice walks in the vineyards, horse rides, visiting castles, tennis, canoeing and walks in the barge, leisure, castles, villages and medieval walled towns, prehistoric and natural caves. .. 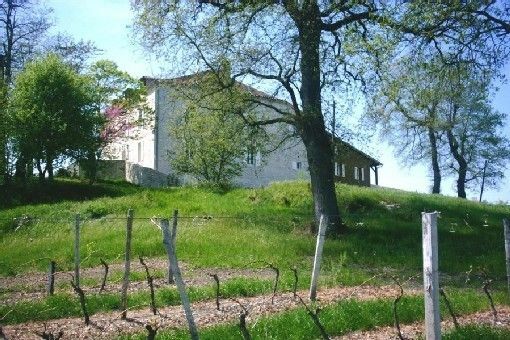 In addition, this family vineyard cottage offers the explanation of the work in the vineyards, visiting the cellars of Château Tourmentine and a tasting. Castle Tourmentine of bottles are available at the entrance in the cottage. Come and discover regional products and Dordogne !! Bread control capability for passage of the baker every Tuesday, Friday and Sunday morning and Wednesday afternoon.